Happy New Year from Ruthin School. 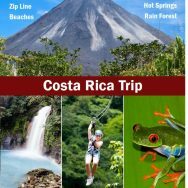 It going to be an exciting year as in June, the Biology and Geography department will be running a trip to Costa Rica. This will be an exciting opportunity to visit one of the most bio-diverse places in the world and see first-hand some of the biological and geographical processes which are studied at both GCSE and A Level Biology and Geography. The trip will include visits to San Jose, Tortuguero National Park, Arenal Volcano and hanging bridges, Baldi Hot Springs, Trimbina Rainforest Centre and Monteverde. All locations fit in well with the topics of both Biology and Geography. Some of the topics included are Ecology, Conservation, Tectonics and Tourism which are important aspects of both these examination courses.